better email marketing campaigns today. eMail Networks specializes in website and email marketing for your business, school, charity or online store. We can update your website or create a new design. We provide the experience, technology and consulting to make your website and email marketing campaigns successful. 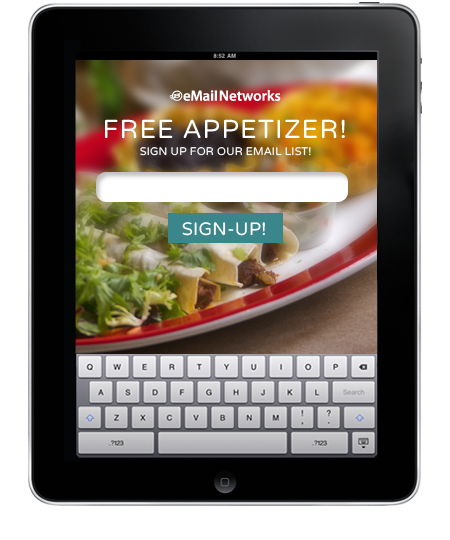 Take your email to the next level with eMail Networks world-class design team. It’s this team that sets us apart: consultants, analysts, and subject-matter experts who ensures our client’s maximum inbox performance by providing consultation on critical aspects of email marketing. Our email marketing design team will work with you to give your emails a professional look. Use your custom iPad Email Collection App on a stand or on a roving mobile device at trade shows, conventions, meetings and other special events. Your subscriber data is automatically stored in your email marketing database and a welcome email is sent to new subscriber. Contact us at (866) 271-5908 to learn about our 45 day FREE trial offer for your email marketing.